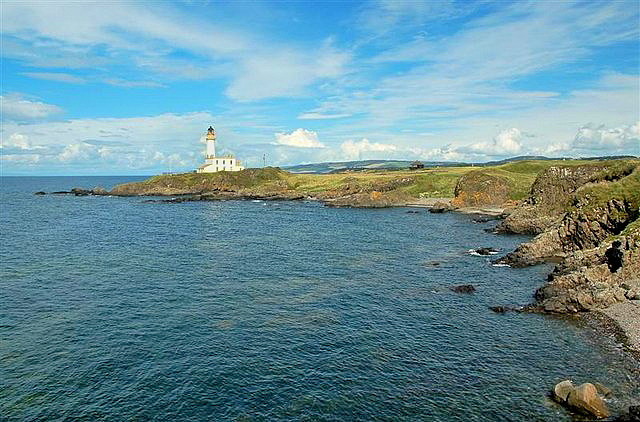 Turnberry Lighthouse marks a dangerous part of the Ayrshire coast and is situated close to the 9th hole of Turnberry Golf Course in what was once the moat of Turnberry Castle. It has unusual surroundings with plenty of scope for nature study and very early observations of bird migrations were recorded by lightkeepers long before observatories were established on the Isle of May and Fair Isle on Shetland. The lighthouse started to be built in 1871 and was completed in 1873 at an estimated cost of £6,576. It was built to warn ships away from the Bristo Rock offshore, after it had been responsible for many wrecks. The initial idea was to build the lighthouse on the rock iself, but engineers David and Thomas Stevenson advised that this was not a good idea, and the place place to put it was on Turnberry Point. The light was first exhibited in 1873, the character of one flash every 12 seconds was decided upon to distinguish it from Corsewall and Davaar lights. It was automated in 1986 and is now remotely monitored from the Northern Lighthouse Boards offices in Edinburgh. Viewed from the northern edge of Turnberry Point. Situated in a photogenic stretch of the Ayrshire coastline in a position which makes it ideal for sunset shots all year round. Look out of the afterglow when the lighthouse starts sending it's signal. Access route off the A719 coastal road north of Turnberry on the way to Maidens. Car park in Turnberry, then it's a walk along the coastline.